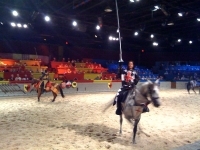 A wildly popular family attraction in Los Angeles, Medieval Times is a dinner event that combines food and entertainment. Guests are treated to a four-course 11th-century feast while being entertained by six knights competing in the joust and other contests. The castle features a tower, courtyard, gift shop, torture museum, indoor stable, and a club with two bars and deejays. Opening times: Show times vary depending on day of the week and time of the year. Check website for up-to-date information. Admission: $61.95 adults, $36.95 children under 12, includes dinner and show.